Gerald Kilburn was born on March 5, 1928, in West Virginia. He enlisted in the U.S. Army on July 17, 1947, and served as an infantryman. Sgt Kilburn deployed to Korea at the beginning of the Korean War, was captured and taken as a Prisoner of War on November 29, 1950, and was released during Operation Big Switch on August 24, 1953. After recovering from his injuries, he served at Fort Wadsworth, New York, from December 1953 to June 1955, and with the 503rd Military Police Company with the 3rd Armored Division at Fort Knox, Kentucky, from June 1955 to August 1956. After completing Infantry Officer Candidate School and receiving his commission as a 2LT of Infantry on November 21, 1956, Lt Kilburn served as a Platoon Leader with the 86th Infantry Regiment of the 10th Infantry Division in West Germany from November 1956 to July 1957, and with the 2nd Battle Group of the 10th Infantry Division in West Germany from July 1957 to March 1958. His next assignment was as a Platoon Leader with the 370th Armored Infantry Battalion and then the 1st Armored Infantry Battalion of the 46th Infantry Regiment in West Germany from March 1958 to December 1959, followed by service as an Army Recruiting Officer in Cleveland, Ohio, from December 1959 to December 1961. During this time, Capt Kilburn completed the Special Forces Officer Course at the U.S. Army Special Warfare Center at Fort Bragg, North Carolina, in November 1961. His next assignment was as Commanding Officer of Detachment A (Contingency) with Company A, 5th Special Forces Group at Fort Bragg from December 1961 to January 1962, followed by service as Commanding Officer of Detachments A-31, A-25, and A-29 with Company C, 7th Special Forces Group, and Detachment A-20 with Company B of the 7th Special Forces Group at Fort Bragg from February 1962 to February 1963. During this time, Capt Kilburn deployed to Laos from March to September 1962. He served as an Advisor with the Military Assistance and Advisory Group in South Vietnam from May 1963 to June 1964, and then as Operations and Training Officer with the U.S. Army Infantry School at Fort Benning, Georgia, from June 1964 to February 1965, during which time he completed Ranger School and the Army Infantry Officer Advanced Course. His next assignment was as an Advisor to the U.S. Army Reserve at Fort Hamilton, New York, from February 1965 to May 1966, followed by service with the Studies and Observation Group in South Vietnam from May 1966 to May 1967. Maj Kilburn served as Executive Officer of Company C and then Company B of the 7th Special Forces Group at Fort Bragg from May to October 1967, and then as Commanding Officer of Company A and then Company E of the 7th Special Forces Group from October 1967 to October 1968. His next assignment was as Commanding Officer of Detachment B-2 with the 46th Special Forces Company in Thailand from November 1968 to October 1969, followed by service as Commanding Officer of Company A of the 6th Special Forces Group at Fort Bragg from December 1969 to June 1970. LTC Kilburn's final assignment was as Chief of Operations with the U.S. Army John F. Kennedy Center For Military Assistance at Fort Bragg from June 1970 until his retirement from the Army on October 1, 1972. 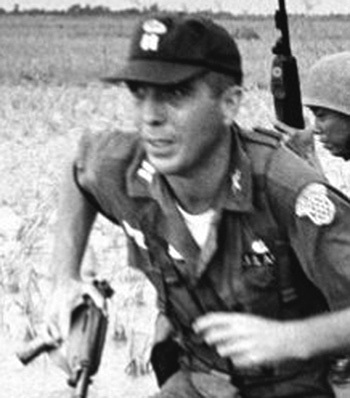 During this time he served as Commander of the U.S. Army Support Group for Project Ivory Coast, the Son Tay Raid, which was a clandestine mission to rescue American Prisoners of War in North Vietnam on November 21, 1970. Gerald Kilburn died on November 3, 1995. Lieutenant Colonel Gerald Kilburn, Infantry, distinguished himself by exceptionally meritorious conduct in the performance of outstanding services during the period September 1970 to November 1970, while serving as Support Detachment Commander, Army Component, Joint Contingency Task Group, JCS Project Ivory Coast. During this period Colonel Kilburn was directly responsible for supervision of the complex training, administrative and logistical support of the Army component while maintaining stringent security for the force in an isolated and restricted training area. Colonel Kilburn clearly demonstrated his exemplary leadership ability in maintaining discipline and morale of the Army component under the most difficult conditions. His ability to recognize problem areas and take the necessary action prior to their becoming critical was a major factor in the preparation of the Joint Task Force for successful execution of its JCS directed mission to rescue and extract United States military personnel held as prisoners of war in SON TAY, North Vietnam. Colonel Kilburn's brilliant and effective planning and execution of all assigned missions made a significant contribution to the overall success of the mission. His outstanding performance of meritorious services are in keeping with the highest traditions of the military service and reflect great credit on him and the United States Army.